Message sequence charts (MSC) and MSC-like languages play a pivotal role in requirements engineering. Particularly, when it comes to model-based requirements engineering, MSCs are used, e.g., to document scenarios, but also, specifically in the automotive domain, for specifying interaction sequences and the interaction-based behavior of such reactive systems. As the use of natural language requirements is still widespread, there exist various approaches to create MSC-specifications from natural language requirements. 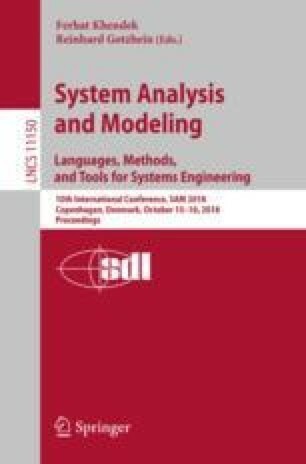 In this paper, we report on a comparative analysis to investigate different approaches for MSC-specification generation. To do so, we applied three approaches to an industrial case example from the automotive domain. Our results show that the different approaches lead to correct yet different MSC-specifications that exhibit different characteristics and are thus suited for different requirements engineering purposes. This research has been partly funded by the German Federal Ministry of Education and Research under grants no. 01IS16043 V and 01IS15058C. We thank Frank Houdek (Daimler) and our former colleague Felix Föcker (Aldi Süd) for their support during the development of the MSC-specifications.